Spending 18 months of sweat dripping labor in his backyard shed (??? 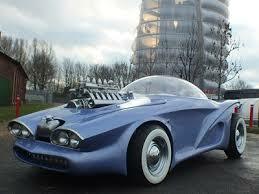 ), Englishman Paul Bacon managed to build one of today’s oddest Frankenstein car creations: the Cosmotron. Using the bones of a 1998 BMW Z3 with a 2.8-liter inline-six, Bacon stripped the ride down and re-built it using fiberglass laid over polystyrene foam to create a new shaped, Jetsons-like body. 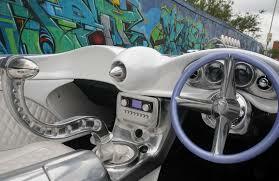 “In the 60s in America, there were a few cars like this, but not too many,” says Bacon in an interview with Barcroft. “When I was a kid, I was always told that by the year 2000, this is what cars would look like and they don’t, so I was incredibly disappointed.” Me too! As the owner of Cyclone Works, a shop specializing in unique bicycles, the 41-year old Bacon is a true man of idealism, always willing to spend time on a mind bending project. In order for an eccentric build-up like this to become possible, though, Bacon says that it must first be approached from a rational and meticulous process. In the end, the 192 bhp, street legal ride is about as close to perfection as a visionary ride can get, providing all of us auto enthusiasts with a glimpse of the future that should’ve happened. This entry was posted in Culture and tagged 2.8-liter straight six, backyard, BMW Z3, cosmotron, england, jetsons, paul bacon, shed. Bookmark the permalink.